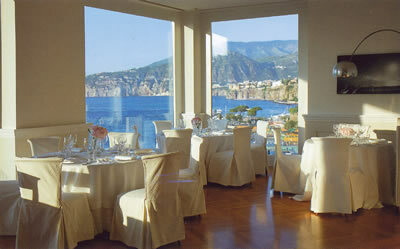 Sorrento is very popular with the British for weddings. This is understandable, for – despite our reputation – we are a deeply romantic nation. 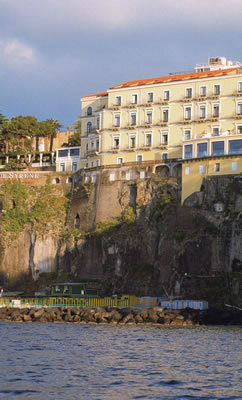 And Sorrento is the place for romance. Viewed from Sorrento, the red sunset over the island of Ischia is one of the most gorgeous sights in the Mediterranean. It must always have been thus, which helps to explain why those lovers of beauty, the Romans – or, at least, their rulers – sought consolation in this part of Italy. They needed to be consoled, for Roman emperors did not always enjoy long and happy retirements. Augustus, for example, was sent into exile, and lived for a time in a villa overlooking the sea on what we now call the Amalfi Coast. Upon that villa’s foundations in Sorrento, in the middle of the 18th Century, the Earls of Mastrobuono decided to build a holiday home for themselves. In 1820 this was turned into a place in which travellers could lodge. And now it is a luxury hotel, the Bellevue Syrene. The clue is in the name, for it does, indeed, enjoy a ‘vue’ which is remarkably ‘belle’. But I came not just for the view, but for the food of Chef Ivan Ruocco. 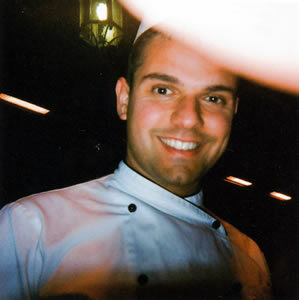 This dashing young man (pictured) was born in 1991 and has already worked in the kitchens of some very notable restaurants, including that of Don Alfonso 1890 (see separate article). He is now the First Chef at the Bellevue Syrene. His cuisine is straightforward, skilful and based upon excellent ingredients. Presentation on the plate is æsthetically pleasing – a characteristic important to those of us who value beauty in life. On previous visits I had dined on the terrace, but this time a brisk wind caused me to retreat to the indoor restaurant. This was no penance, for this spacious, elegant chamber – with its wooden floor, spotlights and artwork by Mimmo Jodice – was comfortable and sophisticated. Moreover, the view was still there, but through large windows of plate glass. The Bay of Naples in the setting sun was as captivating as ever. A supportive armchair had been installed specially for me, so I was able to sit in comfort and note the white napery and the polished glassware (by Bormioli). The service from the waiters in their waistcoats – orchestrated by the charming maitre d’, Gaspare Gargiulo, in black tie – was both friendly and proper. As the pianist tinkled and I tucked into the very good bread and the exceptional olive oil (made from the hotel’s own olives), I felt entirely content. A four course set menu is offered at 70€, as well as a six course tasting menu at 100€. My four courses from the carte were 82€. I began with a dish of lightness, harmony and balance: salmon tartare with olive oil, salt, crispy skin, pea purée and beluga caviar. My pasta course was just as delicious (and just as pretty). This home-made chicken tortellini was well served by its parmesan sauce and delightfully enriched by shavings of black truffle. The roasted suckling pig which came next was accompanied by peas. The peas were not on the menu, but I am a pea-addict and am always asking for them. Chef Ruocco kindly obliged, and so I tucked into the small green beauties with relish. I finished with a lovely ‘re-visited’ tiramisù. Most of the 294 offerings on the wine list are Italian. They include 11 magnums, 5 double magnums and 9 halves. 9 dry wines and 9 sweet wines are available by the glass. Bottle prices – which are reasonable for an establishment of this quality – run from 25€ for a local white to 2,000€ for a double magnum of 2000 Ornellaia. Other bottles to catch my eye were: Krug Grande Cuvée (300€), 2014 Planeta chardonnay (38€), 2013 Cervaro della Sala (75€), 2012 Tignanello (120€), 1997 Solaia (500€) and 1997 Gaja barbaresco ‘Sorì Tildin’ (800€). Of course, I cannot guarantee that when you dine here you will be fortunate enough to catch the red sunset over the island of Ischia. But I can guarantee that you will have a good dinner at the Restaurant of the Hotel Bellevue Syrene. 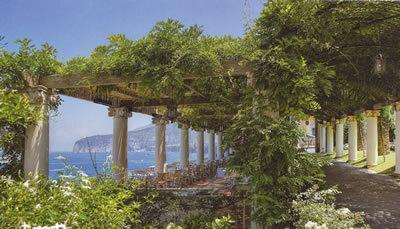 The food of Chef Ivan Ruocco and the romance of Sorrento will ensure it. Do I hear wedding bells? Piazza della Vittoria 5, 80067 Sorrento, Italy.